Elfcroft survey: What I found…. Wow! Choosing just one of the 10 suggestions made by Laura Gaskill would be TOO limiting. Thank you Laura! This article suggests there are three styles (Dewey decimal system not included): bookstore, theme and rainbow order. After paring down and shuffling my books in July, I went with “theme” bookshelves. 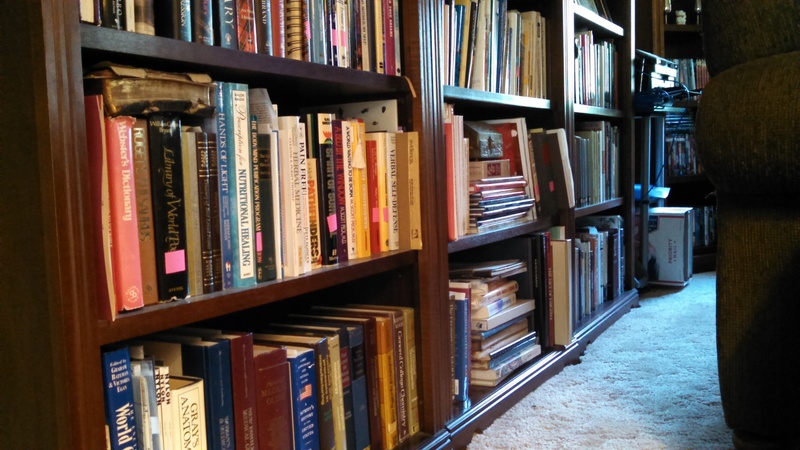 Laura Gaskill has great advice with photos for oversize books, plan to rotate, display covers, care for rare books, rack ’em (children’s), vertical or stacks, accent with bookends and last but not least….leave room for more! My oversize books span decades with The Incredible Year 1968 being a clue. Kenny Rogers, Your Friends and Mine was a gift from my sister in 1987. She had Kenny Rogers autograph it for me. Tennessee, Virginia and Indiana have been home. Hmmmm….I need a rotation plan for these books on the coffee table. I love bookends and often buy them as gifts. My shelves are so full, I don’t often use bookends myself. 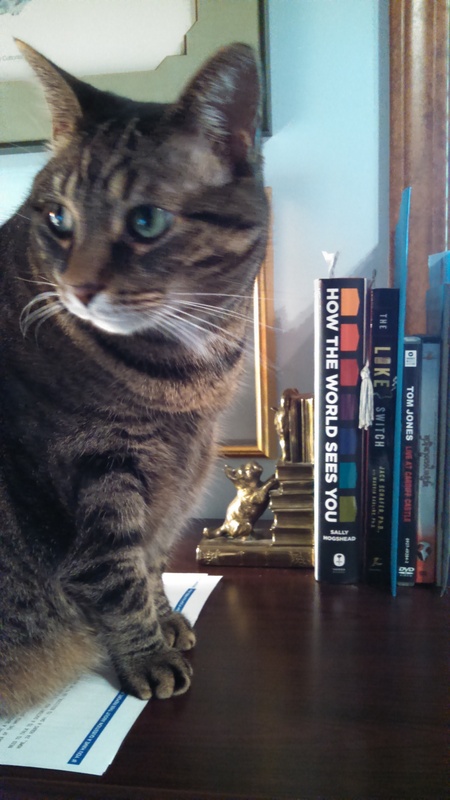 However on my desk is a single brass one of a dog and a cat on a stack of books. My grandmother used it for years. Office assistant Eve…insists her photo is better than a brass cat! AWESOME! Outstanding photos of the libraries and owners! A couple of the interviews had comments about digital libraries. 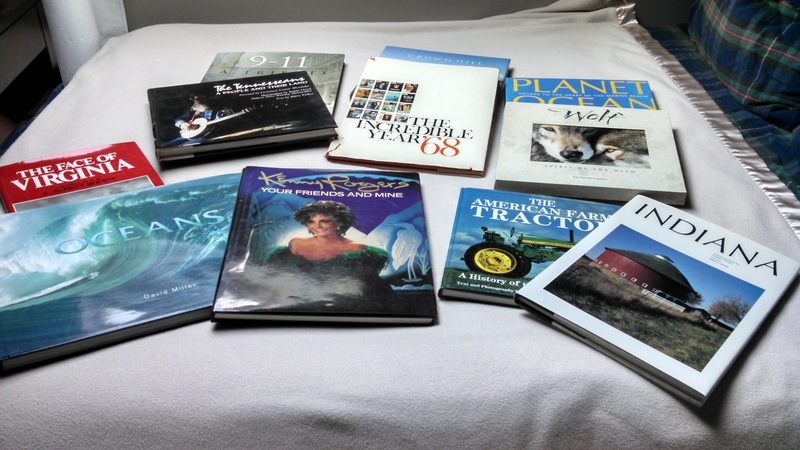 Merging digital and paper was on my mind when I posted “It started when…” on July 28, 2015…part the evolution of my personal library that involved clearing obsolescence and sorting. I put away the recipe for Impossible Vegetable Pie. Pause. Ah ha. Half of my modest cookbook collection is just taking up counter space. 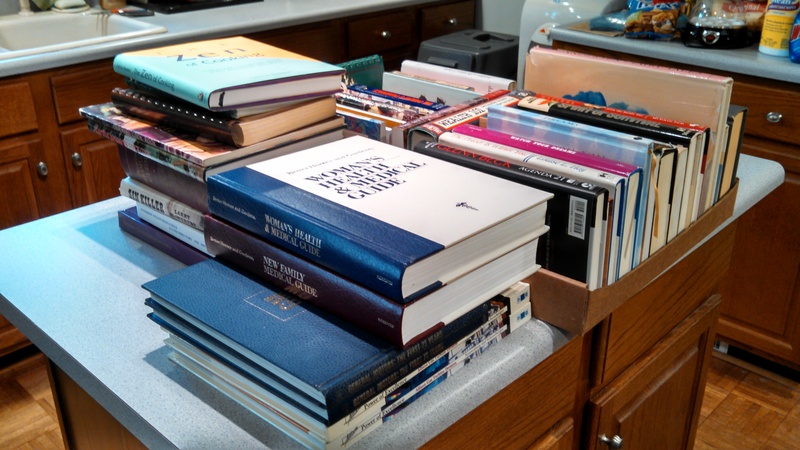 Now those unused cookbooks are headed to a public library book sale. 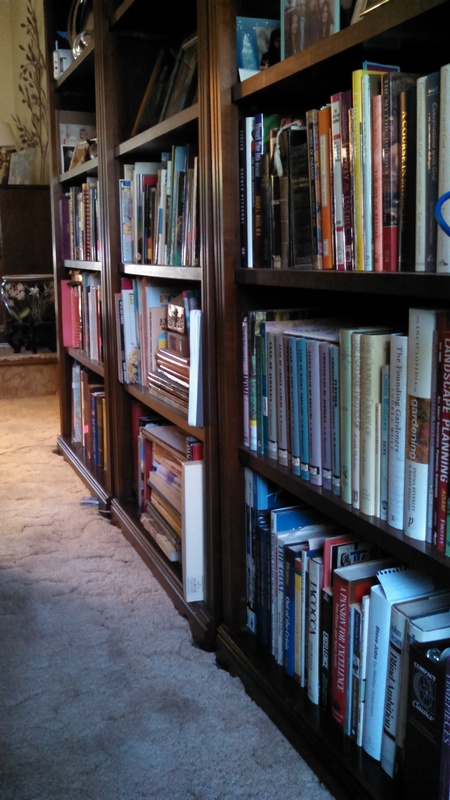 But not before…I’m on a roll…before scrutinizing the nine shelves behind the couch. In 2010, the nine shelf solution was progress. Some of the books I have had 50 years. The thermodynamics text book…40 years. Blah, blah, blah. Since then, I have read dozens of ibooks. The first sort of about 300 books is complete with everything left in place and hot pink stickers on spines of books to donate. 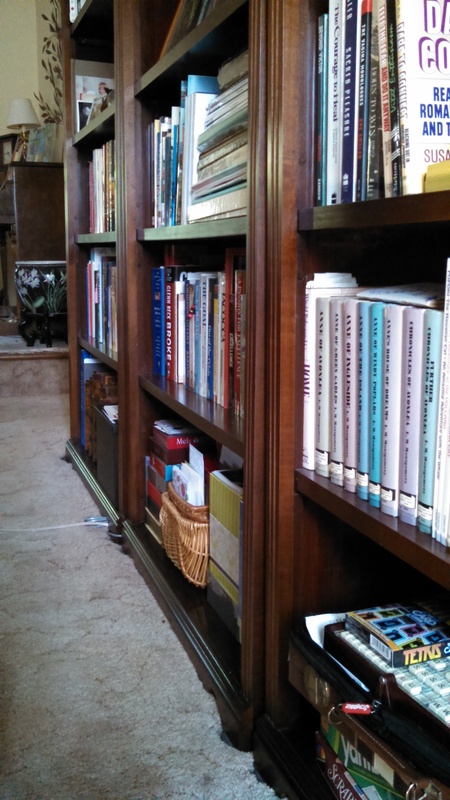 The subjects range from travel, gardening, fiction, non-fiction, business…even organizing…I stopped to scan that one. 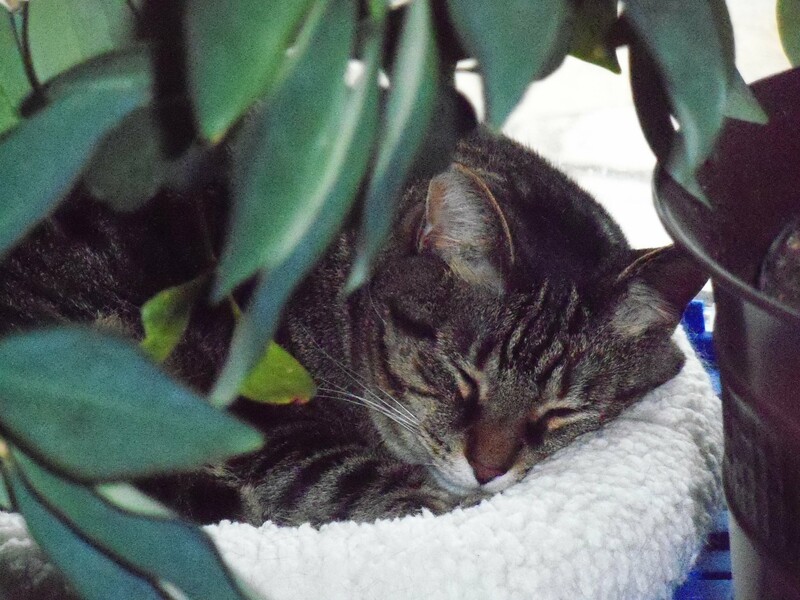 The goal of the 2010 effort was to fill the shelves to keep “Office Assistant” Eve from napping between books. There is no Dewey decimal system in place. I choose to keep the six shelves filled: (2) for favorites, (1) for travel, (1) for business/government, (1) for youth and finally…..miscellaneous!